Upstart political party Pirate Party Australia has put the boot into the Australian government after documents released by CIA whistleblower Edward Snowden suggested the US National Security Agency (NSA) has been routinely siphoning Australians’ personal information and sharing it with Australian intelligence under the auspices of an Internet surveillance program called XKeyscore. Working from documents provided to it by Snowden, UK newspaper The Guardian revealed that intelligence agencies can mine data from NSA-managed databases – which collect and store masses of data on Web histories, social media activity, logins, phone numbers, chat activity, emails, virtual private network (VPN) usage and more – by doing nothing more than filling out a simple Web form. “Not only is the NSA conducting a clandestine, warrantless surveillance program under the guise of the PATRIOT Act, but we now know that an NSA operator can uncover the most private communications by simply completing an electronic form,” Pirate Party Senate candidate Melanie Thomas said in a statement. Queensland-based Thomas, one of seven Senate candidates being put forward for the upcoming federal election in the Pirate Party’s first election showing, called the program “an outrageous abuse of civil liberties”. The party has greatly increased its profile in recent months as the election nears, pushing its four core tenets – freedom of information and culture, civil and digital liberties, privacy and anonymity, and government transparency – and condemning recent revelations of government surveillance, the conviction of US whistleblower Bradley Manning, and Telstra’s apparent complicity in such. The latest revelations have caused a stir around the world after the publication of a top-secret presentation – published online by The Guardian and provided by Snowden – which is dated 25 February 2008 and describes a program for real-time target monitoring. The system, which maintains a three-day ‘rolling buffer’ of all unfiltered data it finds, is described as a ‘massive distributed Linux cluster’ with over 500 servers distributed around the world and a ‘federated query mechanism’ that consolidates search data. According to the presentation, servers are spread throughout Australia, New Zealand, Indonesia, Singapore, the Philippines, Japan, China, Europe, the Middle East, Egypt, Spain, Brazil, Central America and many other countries. The document was set to be declassified in 2032, had it not been leaked earlier. Australia’s involvement is explicitly indicated in the presentation, which is designated as to be shared between governments of the USA, Australia, Canada, Great Britain and New Zealand. 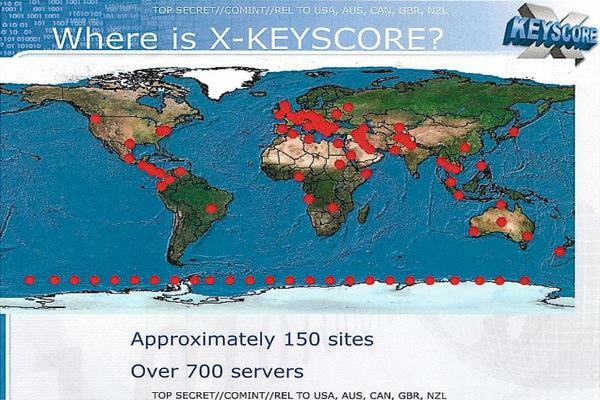 The NSA has been in damage controls since the revelation of its PRISM surveillance program, with the XKeyscore revelations only creating more headaches. The agency’s head defended the programs at the Black Hat security conference even as several US senators pushed for changes to the way the NSA collects its data. The surveillance has been supported by US courts but privacy advocates are digging in for the long haul after a US House of Representatives vote on the spying activities supported them – but by a much slimmer margin than expected.